Great info from the CDC on Cleaning up after rodents! Laundry detergent breaks down the virus’s lipid envelope, rendering it harmless. Additionally, heat generated by the clothes dryer will also ensure that the virus is noninfectious. However, the use of a clothes dryer alone is not recommended as the sole treatment because not all dryers reach the necessary temperature. A temperature of 45 degrees Celsius, or about 115 degrees Fahrenheit, is required to inactivate hantaviruses. Shampoo rugs and upholstered furniture with a commercial disinfectant or with a commercial-grade steam cleaner or shampoo. You may leave books, papers, and other items that cannot be cleaned with a liquid disinfectant or thrown away, outdoors in the sunlight for several hours, or in an indoor area free of rodents for approximately 1 week before cleanup. After that time, the virus should no longer be infectious. Wear rubber, latex, vinyl, or nitrile gloves and wipe the items with a cloth moistened with disinfectant. Since HPS was first identified in 1993, there have been 60 cases in California and 587 cases nationally. About one third of HPS cases identified in California were fatal. The two recent cases bring the total California case count for 2012 to four. Case-patients have been exposed to hantavirus in many areas in California where deer mice live, particularly from the eastern Sierra Nevada region and at higher elevations. Hantaviruses are negative sense RNA viruses in the Bunyaviridae family. Humans may be infected with hantaviruses through rodent bites, urine, saliva or contact with rodent waste products. Some hantaviruses cause potentially fatal diseases in humans, hemorrhagic fever with renal syndrome (HFRS) and hantavirus pulmonary syndrome (HPS), but others have not been associated with human disease. Human infections of hantaviruses have almost entirely been linked to human contact with rodent excrement, but recent human-to-human transmission has been reported with the Andes virus in South America. 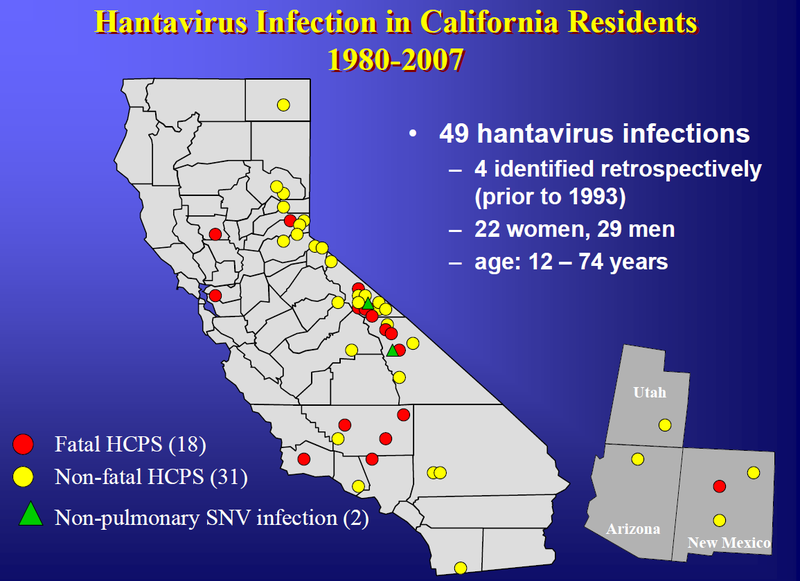 The name hantavirus is derived from the Hantan River area in South Korea, which provided the founding member of the group: Hantaan virus (HTNV), isolated in the late 1970s by Ho-Wang Lee and colleagues.HTNV is one of several hantaviruses that cause HFRS, formerly known as Korean hemorrhagic fever. In 1993, an outbreak of Hantavirus pulmonary syndrome (HPS, see below) occurred in the Four Corners (southwestern corner of Colorado, northwestern corner of New Mexico, northeastern corner of Arizona and southeastern corner of Utah) region in the southwestern United States. The viral cause of the disease was found only weeks later and was called the Sin Nombre virus (SNV, in Spanish, “Virus sin nombre”, for “nameless virus”). Its rodent host, Peromyscus maniculatus, was first identified by Terry Yates, a professor at the University of New Mexico. In addition to Hantaan virus and Sin Nombre virus, several other hantaviruses have been implicated as etiologic agents for either HFRS or HPS. Other identified hantaviruses have not been associated with disease. Febrile phase: Symptoms include fever, chills, sweaty palms, diarrhea, malaise, headaches, nausea, abdominal and back pain, respiratory problems such as the ones common in the influenza virus, as well as gastro-intestinal problems. These symptoms normally occur for three to seven days and arise about two to three weeks after exposure. Hypotensive phase: This occurs when the blood platelet levels drop and symptoms can lead to tachycardia and hypoxemia. This phase can last for 2 days. Oliguric phase: This phase lasts for three to seven days and is characterised by the onset of renal failure and proteinuria occurs. Diuretic phase: This is characterized by diuresis of three to six litres per day, which can last for a couple of days up to weeks. Convalescent phase: This is normally when recovery occurs and symptoms begin to improve. Formerly known as Korean hemorrhagic fever, HFRS is the term accepted by the World Health Organization. patients develop breathing difficulties that range from cough and shortness of breath to severe respiratory failure. Approximately 40 percent of HCPS patients die from the disease. Hantavirus pulmonary syndrome (HPS) is an often fatal disease caused by hantavirus infection. The symptoms are very similar to those of HFRS and include tachycardia and tachypnea. Additionally, patients will develop difficulty breathing, coughing and shortness of breath. Such conditions can lead to a cardiopulmonary phase, where cardiovascular shock can occur, and hospitalization of the patient is required. HPS was first recognized in 1993 in the southwest of the United States by Bruce Tempest MD, and was originally called “Four Corners disease”. It has since been identified throughout the United States. Although rare, HPS is fatal in up to 60% of cases. Rodent control in and around the home remains the primary strategy for preventing hantavirus infection. People suspecting illness are encouraged to contact their local health department. HPS is caused by a virus that individuals get through contact with the urine, droppings or saliva of infected wild mice, primarily deer mice. Breathing small particles of mouse urine or droppings that have been stirred up into the air is the most common means of acquiring infection. The illness starts one to six weeks after exposure with fever, headache, and muscle ache, and progresses rapidly to severe difficulty in breathing and, in some cases, death. Do not use a broom or vacuum to clean potentially contaminated areas as it can make the disease airborne. How are hantaviruses maintained in nature? Hantaviruses are maintained in nature in wild rodents. In California, mainly deer mice carry and shed SNV. Other rodents such as squirrels, chipmunks, and house mice are rarely, if ever, infected and do not pose a risk of HCPS to humans. Persons with HCPS can be readily diagnosed by specific blood tests. The problem lies in it frequently being misdiagnosed as common cold or flu. What types of respirators or masks can farmers and homeowners in rural areas use for protection against hantavirus? For those who frequently handle or are frequently exposed to rodents in rural areas (such as mammalogists and pest control workers), CDC recommends wearing either a half-mask air-purifying (or negative-pressure) respirator or a powered air-purifying respirator (PAPR) with N-100 filters. CDC does not recommend routine use of respirators by farmers and homeowners in rural areas. CDC guidelines (MMWR 1993; 42, RR-11) address specific risk-reduction measures for rural residents (rodentproofing, environmental management, and trapping) and precautions to be taken during activities that may pose increased risk of hantavirus infection (cleanup of rodent infested areas). Cleanup of very heavy rodent infestations or of homes associated with known cases of HPS are special instances for which we do recommend respiratory protection, and these tasks are best left to pest control or public health professionals. There is no evidence that farmers operating farm machinery in open fields (even though rodents may be crushed in the machinery) are at increased risk. Under these conditions, the natural circulation of air and virucidal properties of natural UV light make inhalation of infectious aerosols less likely. The possibility of human exposure is greater in indoor closed spaces, such as barns and sheds, that may be infested with rodents. It is important that outbuildings be rodent-proofed to the greatest extent possible. When effective rodentproofing is not possible, snap traps (and, if necessary, rodenticides) should be used continuously, and recommended precautions (concerning airing out and cleanup of infestations) should be followed when entering such buildings after periods of non-use. 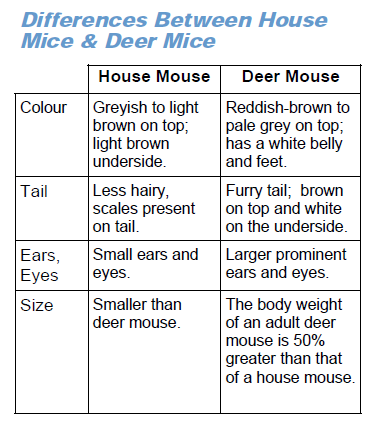 What’s The Differences Between House Mice & Deer Mice? Deer mice are similar in size to house mice but unlike the house mice, are grey to brown on top and white underneath, and have large unfurred ears. House mice tend to live inside and deer mice tend to live outdoors. This entry was posted on Tuesday, August 21st, 2012 at 2:08 PM	and is filed under Misc.. Both comments and pings are currently closed.